The List object as it appears in the Toolbox. The List object is vital to all experiments in E-Prime. The purpose of the List object is to organize the data to be used within the experiment. The List object is where the independent variables, and their levels are organized. In E-Prime, independent variables are referred to as attributes. The term 'variable' has a more specific connotation for E-Prime, programmatically speaking (i.e., a variable is something within programming code). Variables are temporary, and are discarded after their use (e.g., a variable may be used as a counter), while attributes are logged in the data file. 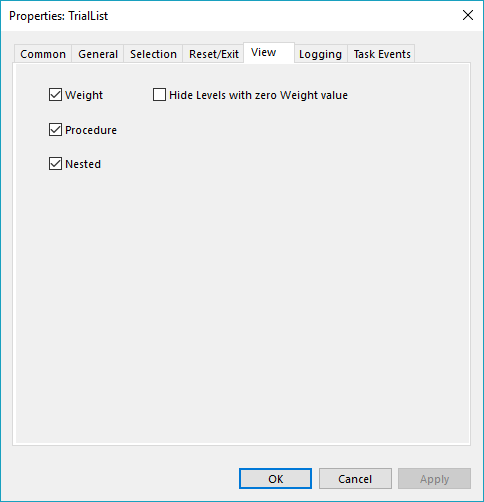 To create a new List object, click the List object icon in the Toolbox and drag it to the Workspace, to a specific location within the Structure view, or to an existing Procedure. Double clicking an existing List in the Experiment Explorer Structure view will result in the window representation for that object being opened in the Workspace, and its properties will be displayed in the Properties window. The List object interface is comprised of a title bar, toolbar, optional summary information and a spreadsheet-like representation of attributes. The title bar indicates the name of the List object, along with the List icon. The toolbar features the available controls for the List object. The controls are also accessible by right clicking in the List object window. The controls available vary based upon the current state of the object. For instance, when an entire row is selected the delete row button becomes active. Adds a new row to the bottom of the spreadsheet grid. Adds multiple new rows to the spreadsheet at one time. Adds a new column to the right of the right-most column in the spreadsheet grid. Adds multiple attributes to the spreadsheet at one time. Reveals or hides the summary information from the window. Opens the set of tabbed Property pages specific to the List object. Deletes the selected row or rows from the spreadsheet grid. The Delete Level button is activated only when at least one entire level/row is selected (highlighted). Verification from the user is required before the action is completed. Deletes the selected column or columns from the spreadsheet grid. The Delete Attribute button is activated only when at least one entire column is selected (highlighted). Verification from the user is required before the action is completed. The Summary displays the currently specified pertinent properties of the List object. 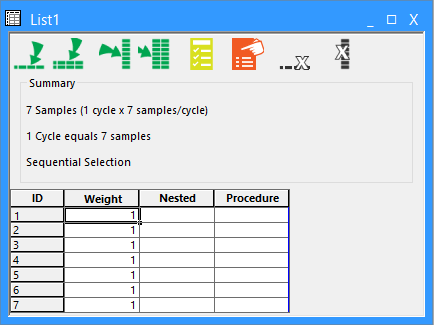 Specifically, the number of samples, the definitions of samples and cycles for the List, and selection information are displayed here. The summary information can be hidden or displayed using the Show/Hide Summary button on the toolbar. The spreadsheet grid features an ID value for each row/level by default. Additionally, the Weight, Procedure, and Nested attributes are also listed by default. These attributes are created by the system, and may not be deleted. They may, however, be hidden via the View tab (see View tab description below). A blue line separates the system attributes from the user-defined attributes. ID Located to the left of each row and may be used to select individual rows, for row-wise editing functions. Rows may also be re-ordered, but they retain their sequential numbering (e.g., if level 5 is moved to the 2nd position, it becomes item 2, and items 2, 3, and 4 become 3, 4, and 5,respectively). Weight Indicates the number of times the level is to be counted in the full list (i.e., number of repetitions). For instance, if the Weight of a level is 2, it will be counted twice in the complete list. Rows with Weight 0 are grayed to indicate that they will not be used in the List. Additionally, an option can be set to hide these rows within the Property pages of the List object. Procedure The Procedure value indicates the name of the object (typically a Procedure object) to be called/executed when thatp articular row is selected. Nested The Nested column allows one list to reference other lists and their attributes. 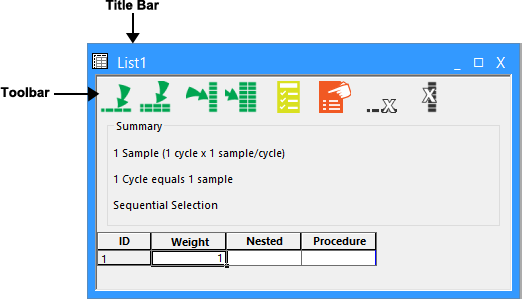 Nested lists are useful when different conditions include different sets of attributes and stimuli, or for sampling from more than one list on any single trial. The values in this cell indicate from which List(s) the attribute values are to be selected. For instance, to select from two lists independently, specify the names of both lists in the Nested column (separated by commas). An example of nested lists is provided in the sample experimentsas part of the E-Prime installation. Cut,Copy, Paste Allows easier editing within the spreadsheet. In general, these operations mimic those in Microsoft Excel (e.g., operates on cells, ranges, rows, columns and uses tab delimited text during clipboard operations). Disjointed Row Selection Ability to select rows to allow operations to be enacted upon non-contiguous rows (e.g., set the Procedure to a common value for rows 2, 4 and 6). AutoComplete Automatically complete the entry if the first few characters typed match another entry in the column. AutoFill Ability to fill columns of a List quickly as in Microsoft Excel, by selecting cells and dragging fill handles. In addition to the Properties window, a set of Property pages is provided for the purpose of setting the List object properties. To access the Property pages for the List object, press the Property Pages button in the List object toolbar. The General tab permits the setting of the Load Method property, to determine how the List object will be populated. There are three Load Method options: Embedded, Script and File. By default, the LoadMethod property is set to Embedded. Embedded Instructs the List to use a "DataSection" to store its values in the full script. With Embedded format, the last lines of the full script contain List defined format of the data.This reduces the size of the script and takes the InitObjects routine much less time to complete. Script The levels of the List will be loaded into the E-Basic script (EBS) file according to the values entered into the List object.This tells the list to use List.AddLevel, List.AddAttrib, and List.SetAttrib calls to fill the List at run- time. The more attributes and levels a List has, the longer the InitObjects routine will take to run. File Instructs the List to load its contents from the file specified by the List.Filename property. The file must be in tab-delimited, ASCII file format, and should contain the level data (i.e., attribute header data). If attributes exist in the file that are not defined in the GUI, these attributes are created. When this mode is selected, the levels in the List object are ignored (and are grayedout). This permits the user to fill in dummy values so that the structure of the experiment remains intact in the Structure view, and/or allows the user to bounce between Load Method values without having to re-enter all of the data. The Selection tab determines the order in which the levels (i.e., rows) within the List are sampled. A variety of ordering options are available through the Order field. Among the options are: Sequential, Random, Random with replacement, Counterbalance, Offset and Permutation. 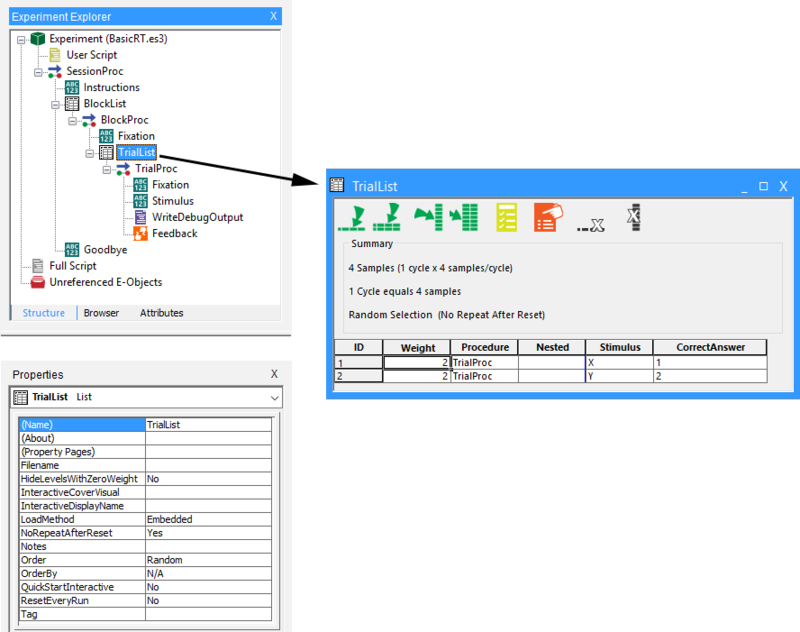 The Reset/Exit tab provides a method to set the run-time sample and cycle counts for the selected List. Summary Summarizes the current property settings pertaining to selection and definitions of the cycle. 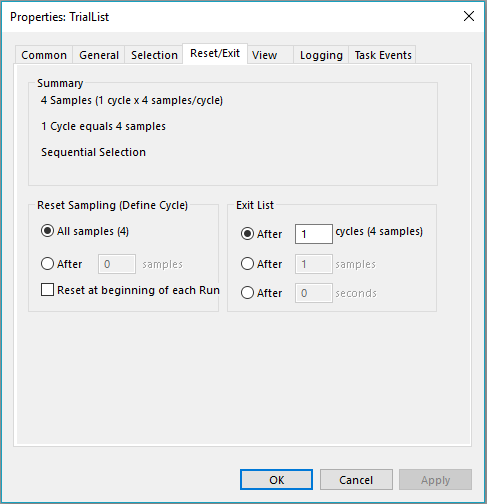 Reset Sampling (DefineCycle) After all samples Resets the list of samples (i.e., replaces exemplars) for re-selection after each has been selected once. After (user defined) samples Resets the list of samples (i.e., replaces exemplars) for re-selection after the specified number of samples. Reset at beginning of each Run Replaces exemplars for re-selection each time List.Run is called. This is helpful if the list is being used more than a single time within an experiment (e.g.,practice and experimental blocks). Exit List After (user defined) cycles Terminates the List after the specified number of cycles is completed. After (user defined) samples Terminates the List after the specified number of samples is completed. After (user defined) seconds Examines the expired time before each sample.If the specifiedtime has elapsed, the List terminates. The View tab features a checklist of system items to be displayed in the spreadsheet grid of the List object window. The Weight, Procedure, and Nested attributes are created by the system, and may not be deleted. However, it is possible to remove one or all of them from the display of the List by unchecking them on the View tab. Additionally, it is possible to hide levels (rows) with a weight value of “0”. If this option is checked, levels with a weight of “0” will not be displayed in the List. If this option is unchecked, levels with a weight of “0” will appear grayed out, but visible in the spreadsheet. 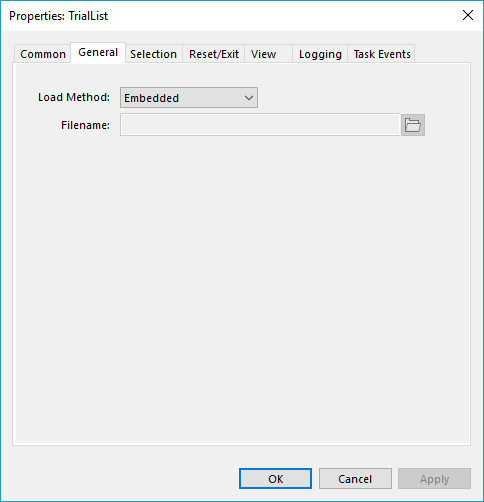 The Logging tab allows the user to select specific attributes to log for each object. The Logging tab for the List object is somewhat different from the Logging tab for an object collecting input. The Logging tab for an object collecting input displays the possible dependent measures collected (e.g., RT, ACC) as well as time auditing measures for the object (e.g., OnsetDelay, DurationError). The primary purpose of the List is as the organization of the data used within the experiment. Therefore, the attributes available for logging on the Logging tab refer to the user-defined attributes entered on the List. By default, all attributes are logged in the data file. However, it may be useful to turn off the logging for specific attributes if they are not of interest. Click the checkbox next to each attribute to set the logging status. In the image below, CorrectAnswer and Stimulus are attributes defined by the user in the List object. The Tag attribute is defined by the system, but because its value is set by the user, logging may be turned off for this attribute. According to the status of the checkboxes in the image below, CorrectAnswer and Stimulus will be logged in the data file, while Tag will not. 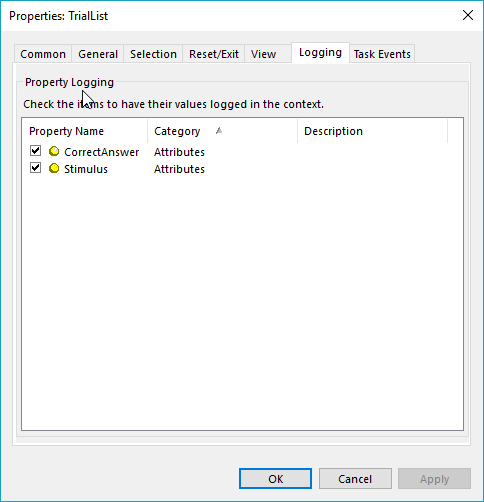 While the disabling of logging for some attributes allows the user to limit the number of attributes logged in the data file, it is highly recommended that all attributes be logged. Many researchers have forgotten or failed to log a measure that was later required by some analysis, or was crucial to some analysis not originally planned. The E-DataAid data handling application includes filtering and exporting capabilities to easily allow the user to display only those attributes that are desired in the data file. Thus, it is recommended that all attributes be logged, and that E-DataAid’s filtering capabilities be used to limit the display or export of the data to include only specific attributes. (About) None Reveals version information for the List object. 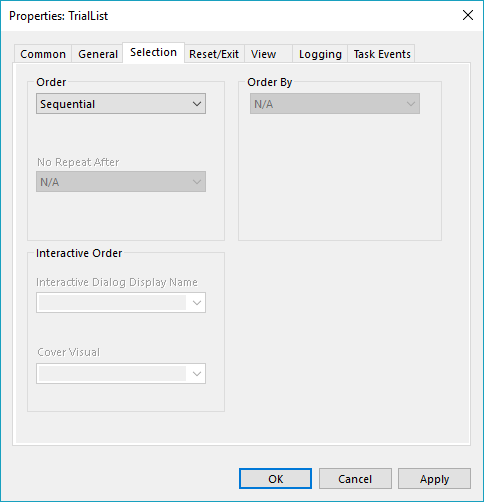 (Property pages) None Reveals the property page interface to specify the properties of theselectedobject. Filename String Designates the tab-delimited text file from which the List will be populated. HideLevelsWithZeroWeight Yes, No Determines if levels with zero weights are displayed. "Yes" will hide the levels (rows) with the weight equal to zero. "No" still allows the levels (rows) with a zero weight to be displayed, but they will appear grayed out. InteractiveCoverVisual Active E-Objects, [attribs] Shows a cover screen on another display while the Interactive list is on another active display. InteractiveDisplayName Active Display devices Determines the screen the Interactive list is shown on. LoadMethod Embedded, File, Script Determines the method by which the script relevant to the List will begenerated. NoRepeatAfterReset N/A, Yes, No Determines if the first item selected after Reset is not the same Level as the last item chosen in the previous order. Order Sequential, Random, Random with Replacement, Counterbalance, Offset, Permutation Determines the selection order of the levels. OrderBy N/A, Subject, Session, Group Determines counterbalancing details. QuickStartInteractive Yes, No Determines a Quick Start for Interactive lists. ResetEveryRun Yes, No Determines whether to reset the List after each run. Tag Alphanumeric User-defined string useful for associating info with the object.